May 9, 2018 — Wednesday — Weeks after the arrival of eBIRForms Package version 7, the Bureau of Internal Revenue released version 7.1 of their application today. The updated version of the eBIRForms package was released to introduce new forms such as 0619-E and 0619-F, as mentioned in Revenue Regulations No. 11-2018 and the updated 1701Q form. Just like the other versions of eBIRForms, you will need to go to https://www.bir.gov.ph/ and click the To download Offline eBIRForms Package v7.1 link. During the download, you will receive a ZIP file containing the installer for the application. The same process goes for the installation, where you have to extract the ZIP file of the installer by right clicking on the file and selecting Extract Here. After extracting the folder, you can then proceed on installing the eBIRForms package. — Still, this version is only available for Windows OS users, and is not available on other operating systems (such as MacOS, etc.). 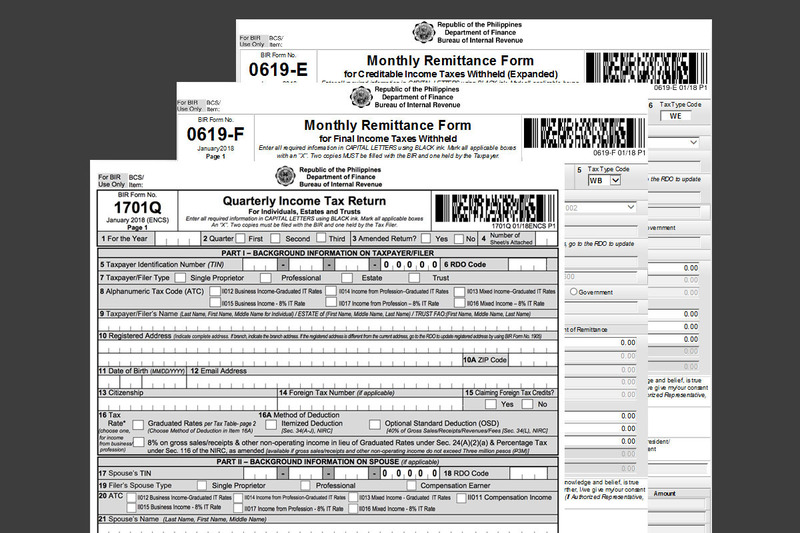 0619-E or Monthly Remittance Form for Creditable Income Taxes Withheld (Expanded). Remember that for non-EFPS filers, the deadline for filing and payment of these forms shall be on the 10th day of the following month, while EFPS filers shall submit those forms on the 15th day of the following month. 1701Q or Quarterly Income Tax Return for Individuals, Estates and Trusts (8% on gross sales/receipts & other non-operating income checkbox in section 16). Aside from the additional and updated forms as mentioned above, there is nothing really new when it comes to our experience using eBIRForms v.7.1. Forms like 0619-E and 0619-F still have no downloadable PDF versions, and only 1701Q is available on the net. But still, experience-wise, everything is the same — you can still add to the fact that this application needs installation and manual data entering. As an alternative, you can use JuanTax in seamlessly generating and filing these kinds of taxes without the hassle of installing and data entry! JuanTax is a Philippine-based cloud tax software which helps businesses in achieving compliance with the Bureau of Internal Revenue (BIR) when it comes to transactional taxes including VAT, Percentage Tax and Expanded Withholding Tax. With JuanTax, you don’t need to download and install the eBIRForms package. Since it is cloud-based, you can use JuanTax on any web platform. All you need to do is create and import transactions with your desired tax forms and that’s it!